Songs of Experience, the 14th studio album from U2, will be released December 1st, 2017 by Interscope Records in the U.S. and via Universal Canada on CD, vinyl, digital download and across streaming platforms. Accompanying the announcement of the Songs of Experience release, Live Nation has confirmed that U2’s eXPERIENCE + iNNOCENCE Tour will begin in North America in May 2018. 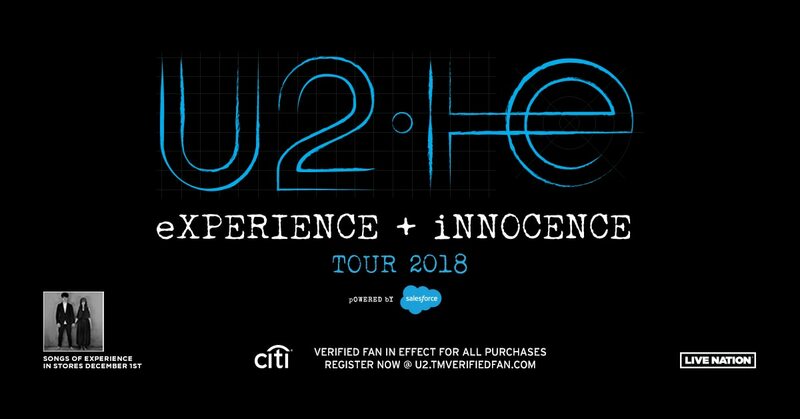 Just as Songs of Experience serves as a companion piece to 2014’s Songs of Innocence, the eXPERIENCE + iNNOCENCE Tour will serve as a sequel to 2015’s iNNOCENCE + eXPERIENCE Tour which saw “U2 reinvent the arena show” (Rolling Stone) and was named the #1 concert of 2015 by The New York Times. The tour will kick off on Wednesday, May 2nd 2018 in Tulsa at the BOK Center. Full itinerary below. In addition to unveiling album artwork by Anton Corbijn, U2 has revealed the final tracklist of Songs of Experience which was completed earlier this year. The lyrical approach of the album was greatly inspired by Irish poet, novelist and Trinity College, Dublin Professor Emeritus Brendan Kennelly’s advice to Bono to “write as if you’re dead’, resulting in a collection of songs in the form of intimate letters to places and people close to the singer’s heart - family, friends, fans, himself. Tickets for the eXPERIENCE + iNNOCENCE North American Tour 2018 go on sale Monday, November 20th @ 10:00 am exclusively through Ticketmaster Verified Fan®. In keeping with their commitment to ensure tickets get into the hands of fans, not scalpers or bots, U2 has partnered with Ticketmaster to use its Verified Fan platform. Verified Fan will power all ticket sales, providing fans who truly want to attend the show with the best opportunity to get great tickets. U2.com fan club subscribers receive first access and can register at http://www.u2.com/subscribe beginning today until Sunday, November 12th. U2.com subscribers will have the first opportunity to purchase tickets beginning Tuesday, November 14 at 10:00 am and running through Thursday, November 16th at 5:00 pm.